Despite advances in preventive health care, medical management, interventional cardiology, and cardiovascular surgery, atherosclerotic disease remains the leading cause of morbidity and mortality in the Western Hemisphere. Cardiovascular disease accounted for 38.5% of all deaths or 1 of every 2.6 deaths in the United States in 2001. Cardiovascular disease mortality was about 60% of “total mortality,” i.e., of over 2,400,000 deaths from all causes, cardiovascular disease was listed as a primary or contributing cause on about 1,408,000 death certificates. Since 1900, cardiovascular disease has been the number one killer in the United States every year except 1918 (1). Treatment of coronary artery disease (CAD) includes risk factor modification, use of antiplatelet agents, medical therapy by decreasing myocardial oxygen demand and coronary vasodilation, and restoring myocardial perfusion using percutaneous coronary interventions (PCI) and coronary artery bypass grafting (CABG). 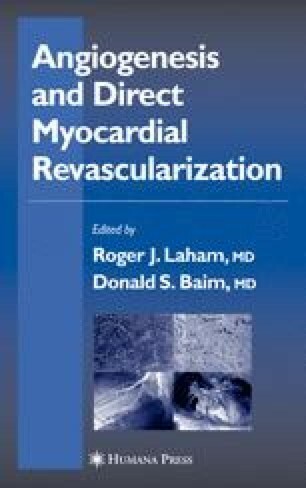 Although significant advances have reduced the mortality of cardiovascular disease, the number of cardiac interventions continues to grow: a total of 1.3 million inpatient cardiac catheterizations, 561,000 percutaneous transluminal coronary angioplasty (PTCA) procedures, and 519,000 coronary artery bypass procedures were performed in 2000 in the United States alone (1). American Heart Association. AHA statistics. (http://www.americanheart.org/presenter.jhtml?identifier=4478).